Hoover Sailor Ryan Squires, poses outside the Mission Bay Yacht Club in San Diego. He competed at the Chubb Nationals in a radial in 2016 after qualifying to represent Area E by finishing first place at the Area E Championship at NCYC last July. I was able to make some of my best sailing memories during a successful 2016 sailing season. This was a culmination of hard work on my part and support from my parents, Hoover Sailing Club, I-LYA, and the Yachtsmen’s Fund. The 2016 U.S. Sailing Area E qualifier was a great regatta hosted by North Cape Yacht Club. Everybody loves their beach, friendly club and experienced race committee. A clinic before the regatta helped improve my sailing with some very high-end coaches. For younger sailors, I cannot emphasize enough how important good coaching is. The more you can expose yourself to really good sailors and their advice, in addition to tiller time, the more you will improve. The Area E qualifier itself had some stiff competition, which made for a very exciting couple of days. I sailed the single-hand in a Laser Radial and was honored to take first and represent the I-LYA at the U.S. Sailing Chubb Junior Championships held at the beautiful Mission Bay Yacht Club in San Diego, California. 2016 brought the second time I sailed Chubbs. While I had a pretty good idea of what to expect, the best of the best were at this competition. With only 20 sailors, the competitors were very close in experience and ability and the tensions were high as everyone was fighting for a top national ranking. Ocean sailing through kelp beds is completely different than sailing in the Midwest! Although everyone took the racing very seriously, on shore everyone was very friendly and we were collaborating racing strategies. In the end, I ranked 12th but was very pleased with some top races that I will forever remember. For anyone who really wants to advance their sailing, I would definitely recommend trying to qualify for Chubb Junior Champs. At Chubbs, they sail single-hand (generally in a Laser or Byte), double hand (usually in a C420) and triple-hand (in various local boats, depending on where the event is). Chubbs was an extremely fun regatta and I learned more there than at any other event I have ever sailed. I want to encourage all I-LYA junior sailors to look beyond our local regattas and make a goal of sailing at regional regattas and qualifiers. Those “big fleet” events test your talents in different ways, expose you to other better racers and push you to do better. U.S. 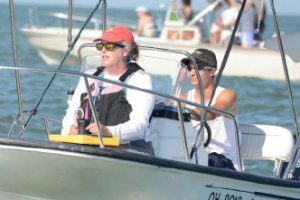 Sailing Junior Olympic regattas can expose you to great coaches, and sometimes, bigger fleets. Go to the U.S. 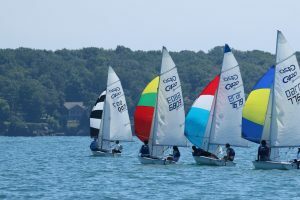 Sailing website to check out where there are Junior Olympic regattas. Who knows, besides the one in Mentor in June, there might be one in New York or Michigan near where your family vacation is planned. The travelling and new venues itself can be really fun, but you have to plan ahead with your parents and Club to make it happen. Also, look where your fleet is hosting regional events like Great Lakes regattas. 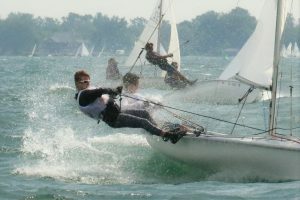 For the Opti, Great Lakes is at Grosse Pointe Yacht Club nearby in Michigan in the end of June. Go to the United States Optimist Dinghy Association (USODA) website for more information. The Thistle Great Lakes is at Edgewater Yacht Club that same weekend, go to the Thistle Class website for that one. Clinics are another great way to expose yourself to great coaching. The C420 class has Midwest and East Coast clinics that you have to apply for, and I know Ian Moran really liked the C420 clinic he did in Chicago. Hoover is hosting an Optimist Race Clinic at the beginning of the season featuring instruction by my sister Grace Squires, winner of the 2016 Traveler Series Opti Fleet. There, kids will learn how to race rig an Opti, roll tack properly and practice starts over the course of one week. See the Hoover Sailing Club website for more information on that. If you can’t make it to a clinic, ask the best Opti, C420 or Thistle sailors at your club to spend some time with you on the water. They have worked hard to be good and it is not surprising that they love to talk about it. Of course, I could not have had a great 2016 season culminating at Chubbs, without the help and support of my family. Working during school breaks for sail funding is important. Even more important is giving back to your local clubs by teaching sailing and coaching. 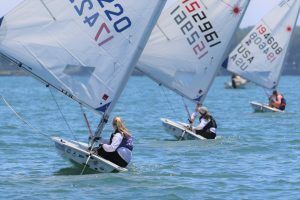 Sailing is an expensive sport, but with the help of the I-LYA Yachtsmen’s Fund I was able to sail on a national level and better my racing skills in ways I will always appreciate.